In bio energy area the group has three wood pellets plants. Made generally from sawdust, shavings and chippings from sawmills, wood Pellets are a natural product, used namely by electricity producers, that using fossil fuels in the energy production, needs to find alternative natural fuels that permits the reduction of CO2 emissions, in accordance with Kyoto Protocol. 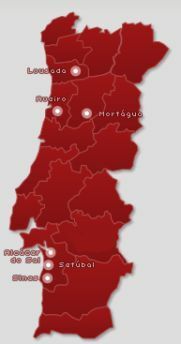 Wood pellets are mainly exported to Central and North of Europe, by vessel from Aveiro and Sines harbour. The 3 plants, Pellets Power, Lda, Pellets Power 1, Lda e Pellets Power 2, Lda, are strategically located in the North, Centre and South of the country, near the raw material sources and the harbour. The annual production of the three plants is around 300.000 tonnes and implied a total investment of 30 million euros. Placed in Lousada this plant was the first to be installed, and is under production since January 2008. Placed in Mortágua, this plant is under production since April 2008. Placed in Alcácer do Sal, this plant is under production since May 2009.